Fundamentally, Guardians of the Galaxy Volume 1: Cosmic Avengers is a collection of six stories, with five introducing the readers to the team members. The sixth story kick-starts plot threads for the series and introduces readers to the concepts needed going forward. 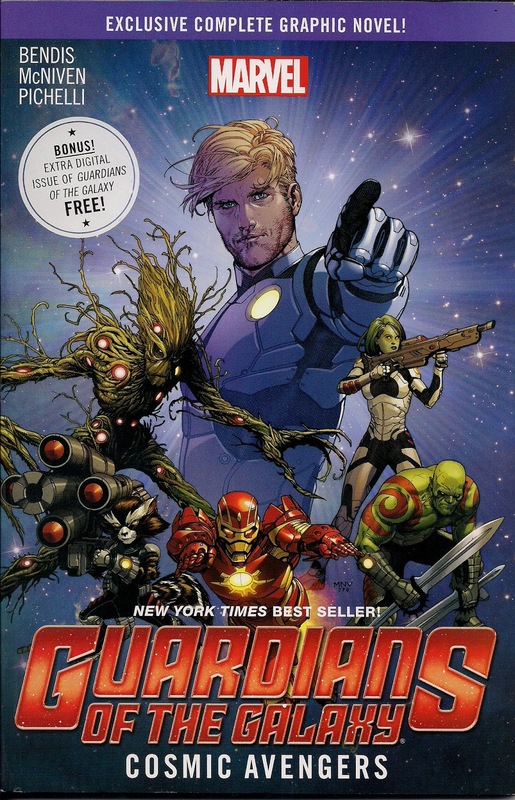 Beginning the this collection is issue #0.1 which gives the reader the origin of Star-Lord. It tells of how his parents, his mother a human and his father the leader of a galactic empire, met and the experiences that motivate Peter Quill (Star-Lord) to be the man he is. This was originally only going to be a short story but, luckily for us, was given a full 22 pages full of great character moments. Through clever pacing Bendis has been able to create a relationship that doesn’t feel forced. Even though it involves an alien it feels like it naturally occurs, which makes things all the more moving when it Star-Lord’s father has to leave. Even though Peter Quill is only a child, the reader sees the seeds of the man he will become through his morals, bitterness and a tragic experience. While these might be familiar in superhero comics, the way they’re presented feels fresh. Issues #1-3 are part of main narrative of the story and introduce readers to many of the concepts that the series will deal with going on. The basis of the story is that through a mutual agreement with the galactic empires of the Marvel Universe the Earth has become off-limits to everyone who is not native to Earth. But by doing so has made Earth a target and it is up to the Guardians of the Galaxy to protect the Earth from these threats. These issues are full of action with a mixture of science fiction gunplay, close combat and a sprinkle of ship battles. Artists Steve McNiven and Sara Pichelli do a wonderful job putting the action on the page with a mixture of large and small panels. The larger panels give the action a big budget feel, making it more exciting. On the other hand, smaller panels give each team member their moment without sacrificing too much the page count. One thing I should mention is the inclusion of Iron Man on the team. While some are going to dig the idea, others might see it as a gimmick. Those not familiar with Guardians of the Galaxy might welcome the inclusion as it gives them a familiar character to work with. in my opinion, I think he gels okay with the team and acts as a good way to have concepts introduced to the reader. For those not big on the idea, don’t worry as he doesn’t stay in the series for very long. Guardians of the Galaxy Volume 1: Cosmic Avengers features plenty of humor, with Star-Lord and Rocket Raccoon mostly responsible for it. Mostly coming through dialogue, Star-Lord’s humor is mostly wit, while Rocket’s is more a black humor. While these are not laugh out loud moments, they do give the title a sense of fun. I really enjoyed the addition of politics to Guardians of the Galaxy Volume 1: Cosmic Avengers with the different alien races discussing what they should do with Earth. It gives an extra level to the story and it makes this science fiction story feel much larger, like it covers more of the universe. Steve McNiven and Sara Pichelli’s art is great throughout, portraying real character moments, while still being science fiction. There one moment with Groot that I thought was fantastic, showing raw emotion on his face. This is something that I believe would not be easy to do with a giant tree alien. My only issue with the art would be Peter Quill’s hair in issue #0.1, which seemed to sit and move in an odd manner. Also included in Guardians of the Galaxy Volume 1: Cosmic Avengers is Guardians of the Galaxy: Tomorrow’s Avengers. This is a collection of four short stories that introduce Drax the Destroyer, Rocket Raccoon, Gamora and Groot to readers giving them a feel as to who they are and their motivations. While some elements feel like exposition, they definitely make up for that with character moments and a roster of fantastic artists. Michael Avon Oeming, Ming Doyle and Mike Del Mundo all do a fantastic job in bringing their character to life. One can only hope that they get to tell more stories with these characters and settings. The only issue with this is the placement of these stories, which would have been better suited to closer to the front than the back. Overall, Guardians of the Galaxy Volume 1: Cosmic Avengers does a great job at introducing new readers to the characters and concepts. While this release has big action and humor, it is the quieter character moments that make the series shine. 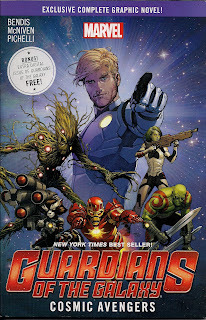 If you are looking forward to the Guardians of the Galaxy movie then this is the comic you should be reading.